Many human beings have considered the powers and the limits of human knowledge, but few have wondered about the power that the idea of knowledge has over us. 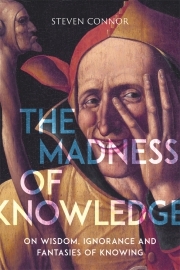 The Madness of Knowledge is the first book to investigate this emotional inner life of knowledge – the lusts, fantasies, dreams and fears that the idea of knowing provokes. There are in-depth discussions of the imperious will to know, of Freud’s epistemophilia, or love of knowledge, and the curiously insistent links between madness, magical thinking and the desire for knowledge. Steven Connor also probes secrets and revelations, quarreling and the history of quizzes and ‘general knowledge’, charlatanry and pretension, both the violent disdain and the sanctification of the stupid, as well as the emotional investment in the spaces and places of knowledge, from the study to the library. In an age of artificial intelligence, alternative facts and mistrust of truth, The Madness of Knowledge offers an opulent, enlarging and sometimes unnerving psychopathology of intellectual life.